It is fun to see the evolution of a concept. These two drawings show exactly that, and the final, the drawing below, is not necessarily the better of the two drawings. 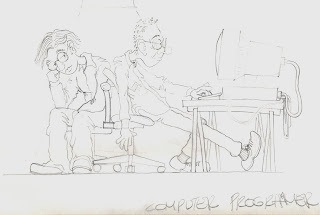 The prelim drawing, at left, is from my sketch book, and depicts the essence of computer hackers after spending waaayyyy too much time in front of the screen. The perspective is a flat, two dimensional side view. The final drawing, below, is from a more dynamic perspective, and shows more action than the prelim, but loses some of the "wired"-ness of the first drawing. 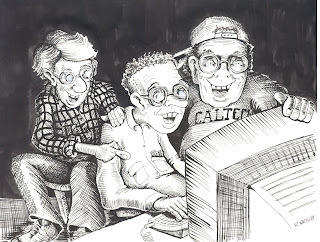 And, the hackers look to be having more fun tapping into someone else's account online. The other thing that the final drawing plays with is the light from the computer screen. The black background gives the opportunity to play with the glow of the computer. Shading then becomes really fun, dramatizing that lighting effect.